Whenever chicken thigh is on sale ,I must buy few packets of the family pack to store in freezer..Usually the family pack are 3 pound or more..I love lemongrass flavour,it's so extinguish,citrus and exotic!! Lemongrass has an intriguing, lemony perfume without the bite that lemons can add to a dish. The taste is refreshing and light, with a hint of ginger.Indeed it's widely used used as a herb in Asian cuisine.It's a must for me to store lemongrass at home for easy cooking.I would love to share this simple not spicy recipe with you:Grilled Lemongrass Chicken in Banana Leave. 1:Marinate chicken thighs with blended lemongrass mixture,each thigh use 2 tbsp or depend on your preference more or less,use ziploc bag to combine herbs and chicken coated well,then store fridge overnight. 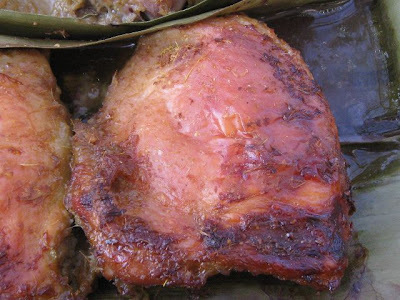 2:Preheat oven to 400 F.Prepare clean banana leave over baking tray,arrange marinated chicken thigh over the banana leave and cover the top part with banana leave too. 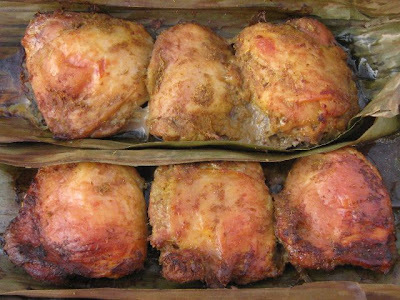 3:Bake chicken thigh at 375 F at middle rack for 45-50 minutes.Remove the top part banana leave,brush/sprinkle chicken with coconut milk all over the chicken.Change setting to broil,grill the chicken for another 10-15 minutes or until the skin crispy golden brown.Insert bamboo stick into the chicken to check the readiness..
4:Remove the chicken from oven and serve warm. 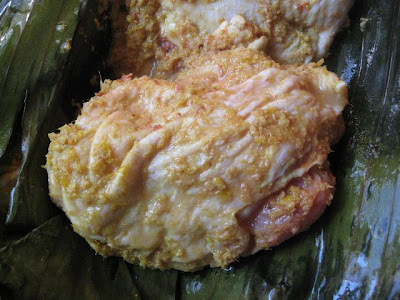 If you like spiciness ,add some red pepper or sambal oelek with lemongrass mixture when marinate..
Hi, Beachlover, this is a very authentic chicken dish...looks so appetizing. 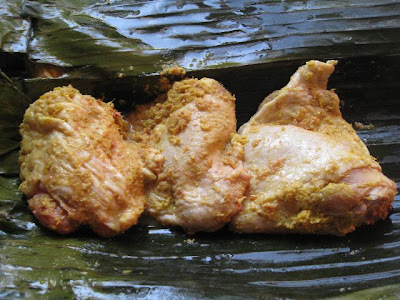 It's a good idea to wrap the banana leaves around the chicken before baking, cos, my chicken always end up with burnt edges. I can only find frozen banana leaves, that will do, right? I really like the smell of banana leaves especially when use it in grilling. I can't wait to crank up our BBQ grill. I think we can't find fresh banana leave here in State or Canada..atleats we still can get frozen,that good enough for us,right? Hope to see your posting soon!! lemongress with porkchop? hmmm I must try that!! good idea!! thanks! oh!! talking about BBQ pit , I can't wait for my new BBQ to arrive tomorrow!! 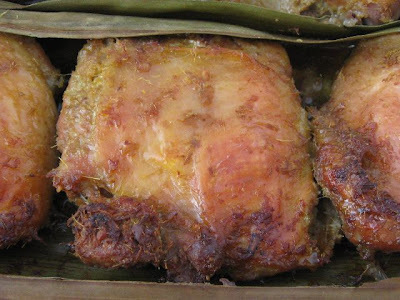 Lemongrass chicken with coconut milk sounds great!